There are three places regarding which the nations of the world cannot taunt Yisroel and say You have stolen them. They are: The cave of Machpelah, the [site of the] Bais HaMikdash, and the burial place of Yosef. To your seed I have given this land. If your follow My laws...you shall dwell securely in your land. And I will give peace in the land, and you shall lie down and none shall make you afraid. In parts I and II of this series we discussed the halachah which prohibits the surrender of territory as stipulated in the Camp David accords, and the folly of giving away so much in return for nothing. Our security has been immeasurably weakened, and the lives of over three million Jews put in great jeopardy. Why did we do it? Why did we voluntarily hand over huge chunks of our land, together with settlements, oilfields, and airfields? How could we surrender our own property? The basis of our submission to the will of other nations is our own faulty self-image, which we have come to base solely on foreign criteria. In our dealing with others, we claim Eretz Yisroel as our own for all sorts of reasons except the true one: It is ours only because G-d gave it to us as an eternal heritage. Nearly 4,000 years ago, at the famous Covenant between the Pieces, G-d promised Avraham that "to your seed I have given the land." Since then, the land has been exclusively Jewish, belonging to the seed of Avraham, Yitzchak and Yaakov. Others may have conquered the land, driven us out, taken temporary possession; but it was never legally theirs. We have never lost our title to it, for it is an eternal heritage from the eternal G-d to His eternal people; and our ownership is as unchanging as G-d Himself. This is our sole justifiable claim to Eretz Yisroel. In the words of Rashi, the foremost Biblical commentator: "Rabbi Yitzchak said: The Torah [whose main object is to teach commandments] should have commenced from the verse (Shmos 12:2) This month shall be unto you the first of the month, which is the first commandment given to Israel. Why then does it commence with [the account of] Bereishis? Because [of the concept expressed in the text] He declared to His people the power of His works [i.e. He gave an account of the work of Creation] in order to give them the heritage of the nations. For should the nations of the world say to Israel, You are robbers, because you took by force the lands of the seven nation [of Canaan], Israel will reply to them The whole earth belongs to the Holy One, Blessed be He; He created it and gave it to whom He pleased. Of His own will He gave it to them, and of His own will He took it from them and gave it to us" (Rashi, Bereishis 1:1). These words of Rashi, written over nine hundred years ago, should be our guide in dealing with the gentile nations. For the Arab peoples are calling us "robbers," saying we "took by force the lands of the seven nations [of Canaan]." And they are demanding this land from us now. Our answer must be: "The whole earth belongs to the Holy One, Blessed be He...He took it from them and gave it to us." This is our reply. This is our claim. And this is why Eretz Yisroel, all of it, is ours. Unfortunately, we respond to their demands as if we had no real right to the land, as if our claim to it is due to the favor and largesse of others. We claim that it is ours because Lord Balfour of England "promised" us a national homeland there; because the United Nations voted it to us in 1947; because of U.N. resolution 242; because in the distant past the Jewish people once lived there, and more recently Jews have come to resettle there once again. But if our claim is based solely on the vote of the United Nations, then a different vote can take it away again  as is happening. If our claim is based on once having lived there, other peoples have in the meantime lived there for hundreds of years. If our claim is based on Balfour, others will say, and with justice, that he had no right to promise it in the first place. No, these are not the ways to answer those who challenge our ownership of Eretz Yisroel. A Jew must stand tall and proud, strong and firm, and with the nobility that befits the Chosen People say to the world: "Eretz Yisroel is ours, all of it, every single inch. Not because you agree, or Balfour said so, or the United Nations voted on it. It is ours because G-d gave it to us  forever. It belongs to every Jew in all generations as a perpetual heritage. No one, Jew or non-Jew, has the right to give away any part of the Holy Land that belongs to the Holy people." No dialectics on the exact meaning of Balfours words; no clever debate on what the various U.N. resolutions mean. We will not wrangle over any of these irrelevant permits when we possess an unshakable, iron-clad deed to the land  all of it. Yet, despite this obvious course of action, we continue to base our claim to Eretz Yisroel on the flimsiest of grounds, and wonder why the rest of the world does not accept it. "Like all the nations is the House of Yehudah"
This approach stems from a general attitude that many Jews have towards non-Jews. It is the attitude of "like all the nations is the House of Yehudah," the attitude that a Jew should deny his Jewishness and ape the non-Jew in all ways. But although ways of the non-Jew may be fine for him, they are not ours. Each must follow his own path, and any attempt to change to anothers is doomed from the start. For we are not the same. "I and Your people will be distinguished from every nation on the earth." This is the quintessence of the Jewish people. Distinguished. Separate. Different. We are not as other peoples, but a nation set apart, sanctified and sanctifying. We are the bearers of G-ds word, and when we walk in His ways we are distinguished as a special people  G-ds people. But recent times have seen a diminishing of that difference, the unique distinction that made us the people of the Book. And with it has gone all pride, dignity and self-respect. In attempting to become as all the nations we have debased and humiliated ourselves, thrown away or denied all that makes us great and unique. And the reward for our pains? We have been spat upon, trampled upon, and gained nothing. Yet we refuse to recognize our errors and stubbornly continue to follow this disastrous path. Those Jews who are ashamed of their Jewishness will do anything to hide and forget their unique and distinctive identity. Even when discussing the fate of Jews living in the Jewish land they use only non-Jewish terms and logic, their primary goal being acceptance by the gentiles as an "equal." So great is their desire for such "acceptance" that Jewish rights  and even Jewish lives  are sacrificed in order to attain this goal. Consider: In 1967, the Arab peoples were preparing to invade Eretz Yisroel, conquer the land and slaughter its Jews. Through miracles shown by G-d, the Jews instead achieved the stunning victory of the Six Day War. The whole world expected Eretz Yisroel to immediately proclaim its sovereignty over the entire land and build settlements in all the liberated territories. It was the natural, logical act. Instead, the government quietly informed the U.S.A. that they neither intended nor desired to hold onto those lands; and that they were willing to return all. At first the U.S.A. thought they were surely jesting  why return these newly liberated territories for no reason, especially when now Eretz Yisroel finally had secure borders? But when the Jewish government reiterated their willingness time and again, the U.S.A. and the Arabs began to believe. And the Arabs concluded that if the Jews themselves insist that these lands do not belong to them, then pressure should be applied for their return without any conditions attached. These lands were a gift from G-d, presented with stupefying miracles. Yet, because we had no trust in G-d, because we wanted to curry favor with the other nations, because we did not believe Eretz Yisroel belongs to us as an inheritance from G-d  we spurned His gift, and literally begged the Arabs to take it back. "Holy Places"  to Whom? Consider: Prior to the Six Day War, the army had contingency plans for every conceivable situation and place  except Jerusalem. The government refused to even consider capturing Jerusalem, for fear of what the Vatican would say, what world opinion would say, what anyone and everyone would say  except the Jews. When, because of security reasons, the capture of Jerusalem became unavoidable, the lack of a contingency plan caused hundreds of unnecessary deaths. And many more casualties were caused by the order that none of the "holy places" in Jerusalem were to be touched; for knowing this, the Arabs specifically fortified themselves in the churches and mosques and from there fired upon Jewish soldiers  knowing the fire would not be returned. Jewish politicians, it seems, preferred to endanger Jewish lives rather than anger non-Jews. Consider: In the aftermath of the Six Day War, the Arabs in Eretz Yisroel were sure that the Jews would exact their revenge on them  as they would have done had the roles been reversed  or at least expel them from the land. They expected no less, and would have been everlasting grateful had they escaped with their lives. Instead, the Arabs were allowed to remain, absolutely no retribution was exacted, and the government spends millions of dollars on their support and education. In the Old City of Jerusalem, very few Jews are permitted to live, while no such prohibitions are laid on the Arabs. As a result, today the Arabs in the Old City number approximately eighty thousand, while the Jewish population is but a few hundred families. We are paying in full today for our mercies of yesterday. The same Arabs we so graciously permitted to remain in Jerusalem and the rest of the land conduct bloody terrorist attacks against Jewish men, women, and children. How true are the words of Scripture "if you will not drive out the inhabitants of the land from before you, those whom you allow to remain shall be barbs in your eyes, and thorns in your sides, and shall cause you trouble in the land in which you dwell." The sad situation in Jerusalem is not due to outside pressure, but because of our own feelings of inferiority. Not only were the Arabs allowed to stay in Jerusalem, but we notified the U.S. Government that we had no intention of keeping Jerusalem for ourselves, preferring to make it an international city representing the three religions of Christianity, Islam and Judaism. How low we have fallen! Jerusalem belonged to Jews a full thousand years before Christianity and Islam even existed  and yet we so magnanimously suggest donating it to the world as a center for three religions. We are ashamed to proclaim our sovereignty over places sacred to us for thousands of years, whereas the Arabs have no hesitancy in claiming Jerusalem or Hebron as their holy places. Consider: Hebron is the "city of our forefathers," one of the four holy cities in Eretz Yisroel. Today, no Jew is permitted to live in Hebron, and it is an exclusively Arab city. As with the site of the Bais HaMikdash in Jerusalem, the Cave of Machpelah where our forefathers are buried is under total Arab control. Jews are allowed to pray there only at certain times, for fear of "antagonizing" the Arabs. The Arab leaders to whom we are so subservient today have inherited their positions from the vicious murders of hundreds of Jews in Hebron in 1929. Have we become so numbed by our feelings of inferiority that we do not hear the blood of our brothers cry out to us from the ground? The bitter irony is that while Jews are permitted to dwell in other parts of Eretz Yisroel, it is precisely in those properties over which our forefathers acquired incontestable ownership that the government forbids Jews to live. The Midrash states that "There are three places regarding which the nations of the world cannot taunt Yisroel and say You have stolen them. They are: The Cave of Machpelah (in Hebron), the Bais HaMikdash (in Jerusalem), and the burial site of Yosef (in Shechem)." For it is recorded in Scripture that, in addition to our ownership by virtue of G-ds promise, each of these places was purchased "for its full price" by Avraham, David and Yaakov respectively. Yet it is precisely in these three places that control and access has been denied to Jews! The tragedy is that we refuse to learn from our mistakes. Immediately prior to the Yom Kippur War in 1973, the government had conclusive evidence that the Arabs were preparing for war; and hours beforehand they knew the war would be launched on Yom Kippur. Yet while the military advised a pre-emptive strike, the government refused to even order a mobilization. They knew war was imminent. They even knew when it was going to take place, but ignored military advice and did absolutely nothing. Why? As was revealed later, the politicians refused to do anything fearing U.S. disapproval, and hoping to demonstrate that they were completely innocent and the Arabs were the aggressors. As a result, hundreds of unnecessary casualties eventuated, hundreds more soldiers were maimed for life, and the enemy came perilously close to victory. Political considerations, the knee-jerk subservience to non-Jews, again took precedence over the lives of Jews. The same disastrous policy is being followed today. The representatives of Eretz Yisroel approached the Camp David talks with the same self-degradation and subservience that their predecessors had displayed before them. True, there was pressure from the President of the U.S.A. But that pressure was initially directed at both sides, for the purpose of getting both Eretz Yisroel and Egypt to make concessions. Yet who buckled under pressure and ceded so many tangible concessions  land, oil, settlements and airfields  and who gave nothing but a worthless piece of paper? Every step on the "road to peace" was accompanied by humiliating concessions on the part of Eretz Yisroel, and an ignominious retreat on virtually every stand. Sadat needed peace just as much as Eretz Yisroel, if not more so, and would just as happily have signed a treaty with us if we had not ceded so much. 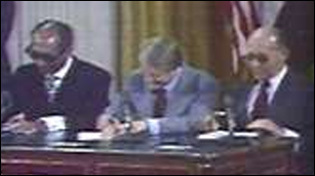 President Carter desperately needed a peace treaty for his political prestige; and had Eretz Yisroel stood firm against ceding anything vital for its security he would have transferred pressure to Egypt. But the moment the U.S. and Egypt saw that Eretz Yisroel buckled under pressure and was retreating from its original stand, more pressure was brought to bear to retreat further, to make further concessions. The "no" which Eretz Yisroel pronounced so adamantly yesterday would tomorrow, with only slight pressure, yield to "yes." Retreat begets further retreat, and concessions further concessions. The U.S. was astonished that Eretz Yisroel was ready to bargain away its very security. It knew, just as Egypt knew, that its opening gambit was just that  a gambit. The U.S. expected Eretz Yisroel to refuse to barter its security; it never expected the representatives of Eretz Yisroel to acquiesce so easily to its or Egypts demands. But once they did, the degrading process of retreat after retreat was in motion. As clear proof of the above, when Eretz Yisroel announced its unwavering decision that Jerusalem would never be given away, Egypt signed the peace treaty without Jerusalem included as one of the concessions  although they had initially claimed that Jerusalem was a top priority. The clear and firm stance in this matter, which no pressure could budge, was enough for the U.S. and Egypt to defer the subject. So too with all the other terms in the "peace" today. Had Eretz Yisroel been firm, and said that its security is not up for bargaining, that Jewish Law forbids such concessions, the pressure on this subject would also have been dropped. Certainly this is true in regards to "autonomy;" for Egypt has no real desire to see a Palestinian state and its inevitably disrupting influence. Egypts talk of "Palestinian rights" was only lip service, necessary for external consumption. The Egyptians would have been infinitely more satisfied had Eretz Yisroel refused to discuss it, maintaining it was not Egypts concern. It would have sufficed for Sadat to gain that part of Sinai which is not vital to Eretz Yisroels security, without the oil or settlements. He would have gained prestige, Eretz Yisroel would have gained prestige, and President Carter would have been satisfied with the signing of the peace treaty. Instead, we gave up everything and received nothing in return. We have become so abject that we have even begun to refer to ourselves in the enemys terminology. We refer to the lands won back in the various wars as "occupied" lands, not liberated. We say we "returned" the lands, not surrendered them. We believe ourselves "aggressors," not defenders of our peoples lives. Because of our negative attitude, we did not develop the lands we had liberated in the wars, establishing only a handful of settlements. We allowed the Arabs to build and expand, and refused Jews permission to do so. We sent a clear signal to the Arabs that we ourselves did not believe they belonged to us, and were ready to give them up. While the enemy was guilty of starting the wars, we were the ones who hung our heads in shame. There are so many instances of timidity in the face of world opinion, and the preference given to political considerations over security. When Arab terrorists carry out bloody attacks against Jews, the government is many times reluctant to apprehend the murderers and punish them accordingly. Only swift action can prevent further atrocities, for to the Arab mentality, failure to punish them for such acts is interpreted as a sign of weakness  and direct encouragement to repeat them. But the government, for political reasons, does not always do so. When, for example, terrorists carried our a murderous attack on Yeshivah students, the government decided not to press the hunt for the killers for fear of exacerbating tensions and "inciting" the Arabs. And when public outcry finally forced action, and the leader of the killers was speedily apprehended, his trial was postponed for many weeks. When the government decided to expel Bassam Shaka, one of the strongest supporters of the P.L.O. in Eretz Yisroel, the pressure from Egypt and other countries caused a speedy reversal. He was allowed to remain, and Eretz Yisroel was shamed and humiliated, the subject of derision and scorn in the eyes of the world. In every war fought by Eretz Yisroel, when the Jewish army was victorious and at the point of total conquest, the Arab countries begged for a cease-fire. When initially the Arabs thought they were on the ascendancy, they refused to even consider requests for a cessation of hostilities, boasting of their plans for total annihilation of the Jews. Yet the government of Eretz Yisroel agreed to halt the war everytime  just when they were on the brink of total victory. Thus in the Yom Kippur War, the Egyptian Third Army which was completely at the mercy of the Jewish army was allowed to escape unharmed. Thus Jewish soldiers were ordered not to proceed to capture Damascus. Thus in the Litani Operation against the terrorists operating from Lebanon, Eretz Yisroel refused to conquer Tyre, the stronghold of the terrorists. The mercy and faintness of heart shown then has come back to haunt us today: the Egyptian army is now stronger than ever; Syria is our most vicious foe; and the terrorists continue to kill our people. "The L-rd restores the pride of Yaakov"
It is not too late. We have fallen low, but we can rise; and when we do, we reach the heights. It is time to act as a Jew, with the pride and nobility that befits the Chosen People. The other ways have been tried, and we have tasted their bitter fruits. It is surely time to show that we are indeed the "wise and understanding people," that we are ready to submit our will to His. It is not too late. If the surrender of the territories poses a danger to the lives of all Jews living in Eretz Yisroel, the strengthening of the land is our protection. We must immediately populate all the lands in our possession, building settlements around the perimeter of Eretz Yisroel. This "security belt" of settlements, especially in the north, east and south, is the surest protection against the infiltration of terrorists. Moreover, the settlement of these lands is the best way of publicly demonstrating that they belong to us, and we do not intend to give them up to anyone. Fear not the wrath of the nations, for we will incur their displeasure whatever we do, whether we settle all the land or but a paltry few centers. When we show the world that it is indeed ours, when we establish our claim through concrete action, then all pressures will fall away. There are tens of thousands of Jews who are ready and eager to settle in these places if they are but allowed. Many, many settlements, thickly populating the land  that is the answer to the non-Jews questions and challenges. Honor is when a Jew stands tall and proud, confident in his G-d and His Torah, and says to the world: We will not give up any more of our land, and we will make no more concessions. We have seen how our enemies honor their word, and we do not choose to place the lives of over three million Jews in danger. The Camp David accords were illegal from the beginning, for no one can give away that which G-d has given to all Jews for all generations. We demand the return of those lands already surrendered, and we demand them as their rightful owners. We do not lay claim to the land because of our strength, our army, or our diplomacy. It is ours solely because it was given to us by G-d, the Holy Land to the Holy People. Moslems and Christians are believers in the Bible, and when we speak to them with the assurances given in the Bible, it is accepted. All other rationales are twisted perversions, and as we see, are not logically acceptable. Our only justifiable claim lies in the Torah, and it is with its strength that we must speak. True peace can only be attained through Torah, through adherence to G-ds will. "The Torah was given to make peace in the world," and "The L-rd will give strength to His people, the L-rd will bless His people with peace." No longer shall we be craven imitators of other peoples, but distinguished, separate, sanctified. Then shall we walk proudly with our G-d, all the Holy People, in all the Holy Land, to welcome our righteous Moshiach.